Welcome to Junkyard Golf Club! Home of crazy golf, weird booze and bad puns. 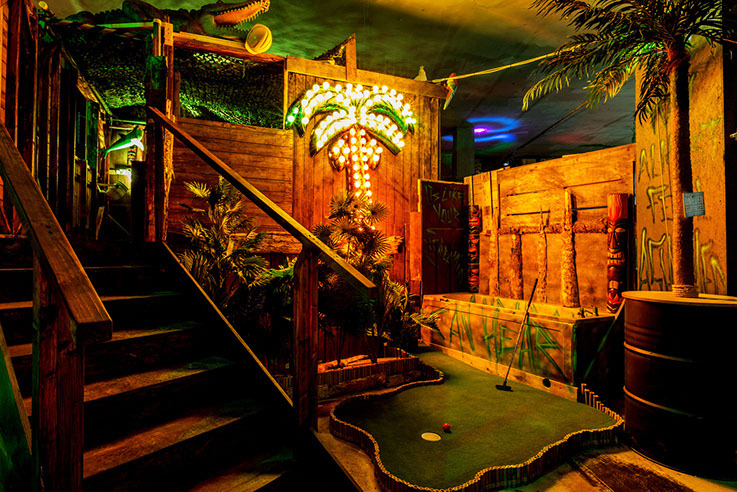 Get excited on three mashed up 9-hole crazy golf courses created from pre-loved and reclaimed random shizzle. Groups can putt their way through all sorts of bizarre holes; think UV garage, scrapyard slides, circus freaks and jungle bathtubs. ID is required to enter the yard at all times. Please see below for our Under 18s policy. Bookings can be made online for groups of up to 20. During peak times, we recommend booking in advance to secure a time slot of your choice. Groups larger than 20 should email bookingsoxf@junkyardgolfclub.co.uk to get puttin! Walk-ins are welcome all day, every day! Please bear in mind that at peak times or for larger groups there may be a short wait to get on to the course, but there’s a bar for that! Please note Junkyard Golf Club’s venue contains flashing lights, UV lights and loud music. ID is required to enter the yard at all times. Please see below for our Under 18's policy. Tell me about it for FAQ´s sake! What your policy on under 18s?! Sunday to Friday before 7pm, last entry 6pm. One paying adult must supervise every 4 under 18s. We operate a Challenge 25 policy and ID will be required when entering the yard! What’s it gonna cost me?! COOL! How do I book? Tickets are available to book online but we also offer a limited number of walk-in slots, available from the venue. These are available on a first come, first served basis, but can’t be purchased for later times or future days, soz! If you have a group of OVER 20 playas, please email bookingsoxf@junkyardgolfclub.co.uk. SICK. When should we turn up?! Can’t I just leave a deposit and pay the rest on the night? Afraid not, sorry! We can only reserve tickets once they’ve all been paid for in advance, we always recommend booking online. So, what if there are more of us than the amount of tickets that are available online? Why is 8 the maximum number of putters allowed on a hole at a time? Any more and you’ll slow down all the other putters behind you, we don’t want any brawls on the yard! I can’t find a contact number?! Can I get a refund or change my time slot? We offer a refund if you give us 48 hours notice prior to your booking. We can also change booking/time slots if you give us 24 hours notice. We do not offer refunds or rebooks if you are asked to leave or denied entry to our venues, for more information please see our Terms & Conditions. Oops, I forgot to add an additional playa to the booking! How do I add them? Get yourself back on the ticketing page and buy an additional ticket for the same time slot on the same course, simple huh? - If it’s for few extra people, book them on the following time slot and they won’t be too far behind the rest of your group. - Don’t forget that there are also a limited number of walk-in slots that are available to buy at the venue on the day. You could always get down early to buy one of those! Can’t you just squeeze one or two more people on? Unfortunately not. Walk-in tickets are only available to buy from the venue on the day. It’d be unfair on all the other putters to prioritise, sorry! How long does it take to get around the course? That depends on when your booking is, the ability of the players in your group, how many are in your group and how many party drinks you’ve had! The average is an hour. We’re playing 2 or more courses. How much of a gap should we leave? We recommend leaving 1 hour to avoid missing your second round. You can always get a drink and some snacks whilst you wait! How many bars are there? There are two main bars in the venue serving a great range of cocktails and party snacks, plus a bar halfway around most courses. Loser buys the drinks! What kind of food do you do? Get involved with our selection of hot dogs, nachos, popcorn and pick ’n’ mix available at our main bar! Can I prepay for food and drink vouchers for my group? -£7.50 Drinks Tokens: Cocktails, Prosecco & Tequila Slushies. -£3.00 Food Tokens: Hotdogs, Nachos, Popcorn and Pick 'N' Mix. Bookings over 20 people can organise food & drinks tokens with the member of the bookings team that they’re dealing with. Afraid not, sorry. It’s generally not too much of a wait to get one though! Do you do any discounts? HELL YEAH! Students get 50% off on Sundays-Thursdays. Simply show up with your ID or use the code 'STUDENTDIZZY' when purchasing tickets online. Proof of student status will be required at the venue! For corporate bookings of over 20, how long before the event do we have to pay our invoice? At least 2 weeks before the event, but the sooner the better please. If you haven’t paid by then, we’ll have to release your tickets. The majority of our reservations are made at least 2 weeks in advance, so for us to have any chance to re-sell them we have to stick strictly to this rule. Can I buy gift vouchers? ‘Fraid not right now, but we are looking into this for the future! When’s the last tee off time? I’m not totally happy with my Junkyard Golf Club experience and would like to take my issue to the correct person. Who can I talk to? We’re really sorry to hear this! Please email customerservice@junkyardgolfclub.co.uk and we’ll be in touch within 24 hours to help! We operate Challenge 25 and photo ID is required. We also operate a safety policy regarding excessive intoxication; if you appear to be, you may be asked to leave or refused entry. © Junkyard Golf Club Oxford 2019.